But, exactly … maybe. Sort of. Having the Internet is kind of like living in a library – minus the feel of a library, the sights of a library, the smells (seductive and repulsive) of a library, the attendees of a library, the weird librarians at the library, the awful cafeteria at the library … . 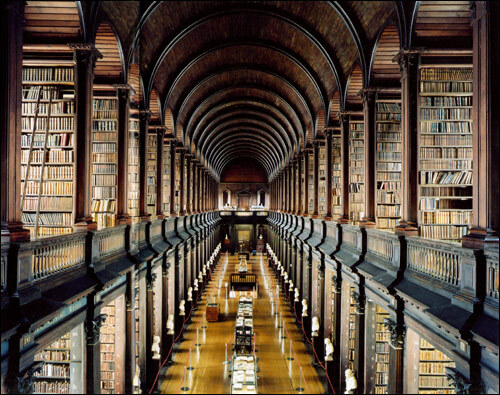 In fact, nothing like a library, except the information in it. Maybe the having of an Internet connection is more like living with a library, sharing an apartment with a brainiac roommate because both of you are underfunded. To our mind, being connected to the Internet is like being a contestant on “Who Wants to Be a Millionaire” (obviously, nobody who thinks that that sentence ought to have a question mark) and, asked a stumper, you use your lifeline to call IBM’s Watson (if Ken Jennings has taken his landline rotary phone off the hook). So, not precisely like a library, but an argument could be made. In fact, Gopnik’s made it. But, we pondered, arslocii-wise, that as much as the Internet is or is not like a library, or to what degree it resembles or interfaces with us like one, what the Internet can never seem like, or make us think it is anything like, is an art museum – another public institution that we might find ourselves in for educational or edificational purposes but, in this instance, so thoroughly unreplicatable in the digital universe. Think of it: In Gopnik’s paradigm, he’s basically equating books with what’s in them – just the words, ma’am. Fine art is different – it’s the being with that’s vital. 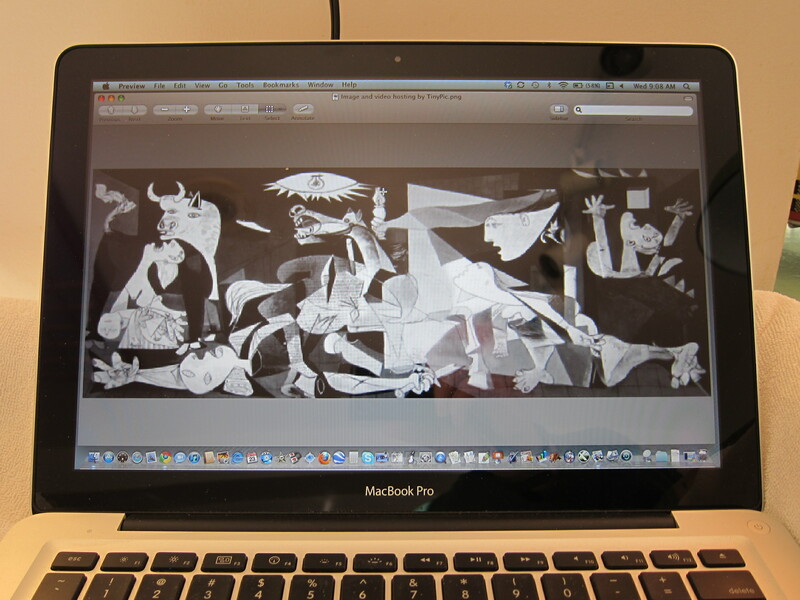 Sure, if all one wants is to know what, say, “Guernica” looks like – complete with zoom-in, zoom-out views – then seeing it online is fine. Like looking at a postcard. 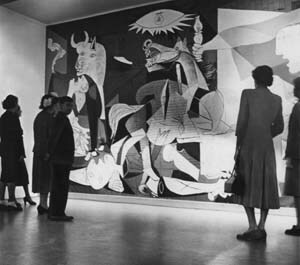 But is it really the “Guernica” experience that one is getting? Isn’t it, like Gopnik’s library, merely the information and not a true encounter with art, and certainly not with the environment that art is in and itself creates. By relying on the Internet to “see” a piece of art, one would not experience scale, or see brush strokes, apprehend the true colors, feel how it “echoes” in the room – perceive its power. One may read “The Great Gatsby” on an electronic device and get nearly the same thing out of it that you would get out of reading it in a paper and print book. But “Starry Night”? It would be like listening to “A Day in the Life” through your cell phone. And sculpture? Forget about it, even with software that allows you 360-degree views. The Web is merely like the catalog for the real show. Of course, photography fares better than other physical fine arts online, but even there, online one misses the size, and the grain, and – as good as one’s computer monitor is – the tonal variations and gradients, and the color of ink: a silver print looks like a digital capture. Ansel Adams would not be happy. So, viewed through this blog’s placeness filter, there is, actually, a comfort that comes out of all this. Two comforts, really. 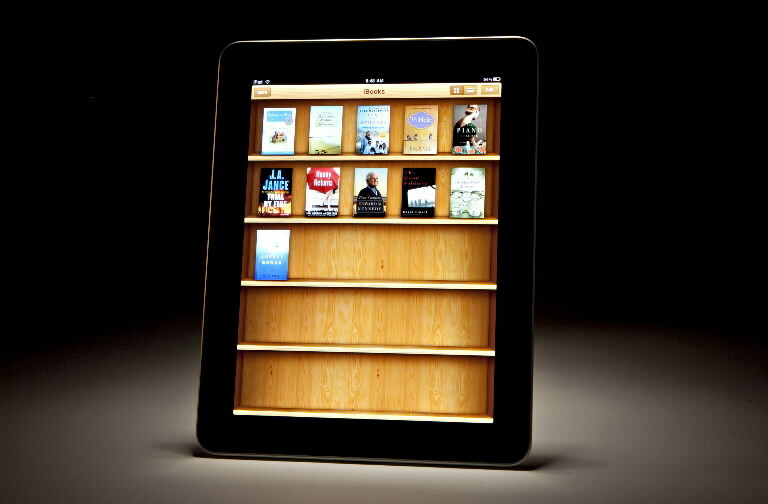 First, the comfort of having incredible access to articles and books, reference and opinion, all with a few clicks or taps or swipes, right at our beck and call, whenever, wherever – a miracle, really (let’s not forget Arthur C. Clarke’s law that states that any technology sufficiently advanced is indistinguishable from magic – the Internet, then, being one of the greatest of tricks, or illusions). But, more to the point: There is the comfort of knowing that there are some things that cannot be replicated digitally, ever – that to not just see something but to live it, one has to be at a specific place in order to be with it, to share personal space with it, to view it for all it is, to go back to it over and over and see more and more of it (because, each time, there is another perceivable element, and more to think about it), to feel its value by more intimately understanding the act that created it, to “friend” it in a way that Facebook never can, and to make it one’s own, in ways deeper than one can imagine we are capable of. In other words, by having a human interaction – by realizing that the power is in being with a piece in a place, and the give-and-take symbiosis of the two … the three, actually, when you include yourself. Placeness, in other words. Arslocii. Do you hear it? The creak of wood, the pinging of heating pipes, the west wind rattling a downspout on the north side, a whirring refrigerator motor, buzzing transformers in the basement. Every house has its own sounds, sounds that you grow up with, sounds that you tolerate and sounds that comfort you. Some people are spooked by sounds that houses make, thinking that there is someone else making those noises. To me they only confirm that you are residing in a living, breathing thing, and each has its own peculiarities. Of course, every house has electrical and mechanical systems, but even the same kinds of systems sound different in different houses. 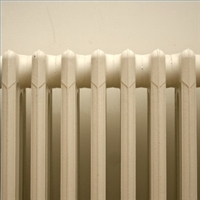 There is a special resonance to every abode depending on the materials that define them, as well as the age of the structure. 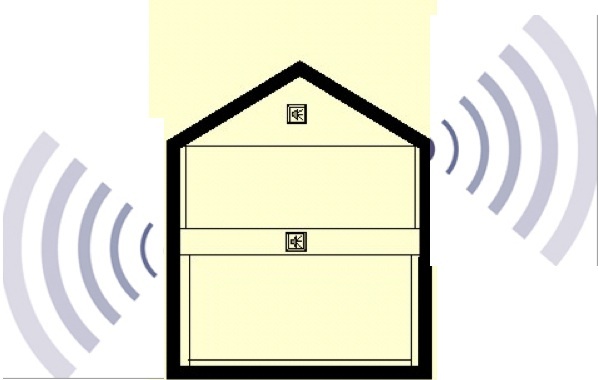 Some places have audible settlement sounds, generally in the same vicinity repeatedly. Most are more alive in winter time because of moving water, expansion and contraction, wind knocking against windows and whistling through the tiniest of openings. A low tick, tick, tick of metal, a sudden low crackle of wood as the sounds ricochet, encircling as a kind of surround-sound. There can be a repetitive pattern if you listen for it, first on the left, then in the hallway on the opposite side – traveling sounds. Then, as an accent, a clock chimes in and it becomes an interesting orchestrated piece: behind you the tympanum, downstairs the triangle. This house we occupy doesn’t have much in the way of settlement sounds because it is built like a bunker: twelve inch-thick walls. And it sits atop a hill that is mostly rock. It has been this way for 138 years, so whatever settling it might have done may have been before our time. Or maybe its solidity just prevents us from hearing those sounds. It has seen many renovations and various uses and reuses, but based on the lack of settling noises, nothing has fazed its structure. It has even lived through a hurricane untouched, despite the house across the street having its roof peeled off. Most of its sounds are of internal systems and materials, added and changed over the years. I wonder whether there are more house noises at night or whether it just seems like it because there are generally fewer other noises. Or do houses come alive at night? Contracting after a sun-soaked day, warmth breathing cold through the stone walls, the heat pipes ramping up to try to accommodate the change in temperature. Thunk, ping, click. The rhythm of the sounds dances around the rooms, mostly on the floors, sometimes on the walls, like Mr. Astaire. When I am alone in the house I find the sounds to be soothing, friendly, familiar, predictable, companionable. Sometimes I think that if the house were dead silent it would feel strange. It wouldn’t commune with me. It breathes, it hums, it burps. We have recently lost the sounds of long-time cats – if you think cats are quiet, you have never lived with any. There is now a void where their sounds had been. If the house fell quiet it would seem alien. As we know, learning the sounds of a new dwelling can be strange. Sound does create place just as places create sound. After twenty-five years in the same house, it would take me a while to adjust to what comes with a new place. I can close my eyes, and listen, and know where I am. I hear these sounds when I sleep and they are a lullaby; without them I would likely wake up. Although I have inhabited many places in my life, there are only two that I have such intimate connection with in knowing their sounds: my parents‘ home and, now, mine. It is one of the features of homeness, the placeness of sound. 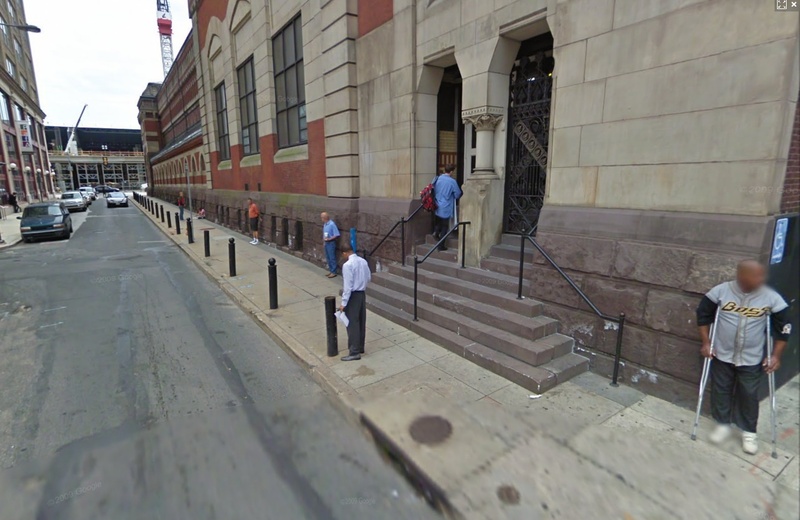 For as long as anyone can remember, the little stretch of midtown Philadelphia real estate has been just one thing: the 1400 block of Cherry Street – a narrow byway of such little distinction, most people have thought it was just a sunless, easy-to-miss alleyway that runs alongside one of the finest buildings a city could possess, Frank Furness’ glorious Pennsylvania Academy of the Fine Arts. But, what a driver sees (there are few pedestrians, other than art students, who make their way down there) when zipping through that block is not the wonderful front of PAFA, but its nicely bricked but otherwise inconsequential and street-unfriendly north-side façade, and some back doors; and, across the street, a similarly semi-interesting side to another of the school’s buildings, the Hamilton. By block’s end, where Cherry meets 15th Street, there is a corner convenience store and a parking lot. If ever there was a place so close to great art and, at the same time, a whisker’s distance from great architecture, that had so little presence and placeness as this street … well, we defy you to find one. Most people don’t know it’s there; it’s the kind of street you don’t even realize you’re on, and once past it, can’t quite remember having been on it. In a big city, it is one of those nonentity streets, a shortcut, a place where you might find a parking space. It’s not the road to nowhere – it is nowhere. But, now, it is on the verge of becoming somewhere. Some locales are born with placeness, some achieve placeness and others have placeness thrust upon them. The 1400 block of Cherry Street falls into the latter category and, with the help of big bucks and an artist of American iconography, is destined to be transformed into, oddly, a destination. If you walk on Cherry Street due east from the Academy, crossing Broad Street, you will more than likely bump into a burly construction worker helping to put the finishing touches on the new, hulking, even monstrous addition to the Pennsylvania Convention Center. 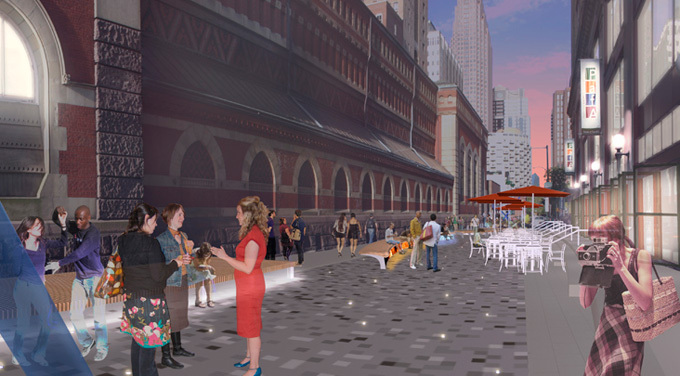 It is this massive taxpayer-funded project, with its gigantic main entrance staring right down Cherry Street, that kickstarted the idea of a plaza of some sort as a way to prettify the view for conventioneers, and at the same time create a connecting walkway between the two PAFA buildings, and at the same time devise a tourist-y locational conceit. The improved area would be seen as and deemed a conduit – feeding who? Doctors here for the orthodontists’ annual convocation? – to what’s being marketed now as Museum Mile, a jeweled cultural belt along the Benjamin Franklin Parkway with the Barnes Foundation, Rodin Museum and Philadelphia Museum of Art as the most glittering of the gems. 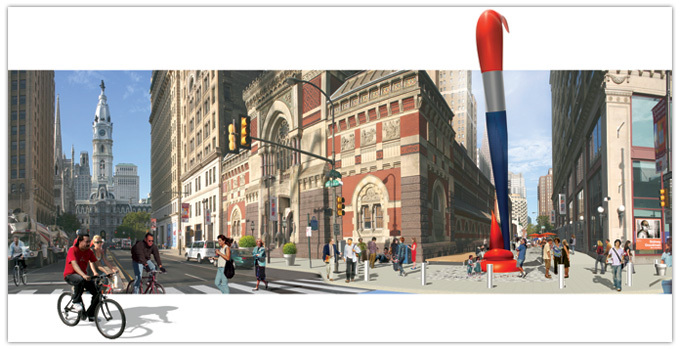 So, the centerpiece of the plaza (groundbreaking for which occurred last week) is an apropos, if obvious, art-linked object: A giant paint brush, complete with humongous paint drip. Nicely, it will lean out from the plaza and be visible on Broad Street, like Lady Liberty’s torch – its red-paint coated bristles acting as the beacon, its long, thin body angling down like a finger pointing to and, ultimately, anchoring in the plaza. From there, Olin has designed a self-contained yet open-at-both-ends hard-surface fuselage, complete with a long and curving bench, tables and chairs, and congregating and activity areas. It is easy to picture it as the outdoor public space that the building-bound Academy has craved: a place for students to mill in between classes, a spot for performance art, a location for post-openings soirees, maybe even clothesline shows for starving young artists. It makes the institution seem less cloistered, and brings its esoteric doings – mysterious to a suspicious, generally culture-averse population – into the light and air. But how it will be used – how the institution will permit it to be used – will determine if it attains a placeness. The city – indeed, every major city – is peppered with plazas that, despite good intentions, are arid, unfriendly dead zones, little- or unused, stark scapes that even pigeons avoid. Too much or too little sun, no place comfortable to sit, bad feng-shui, purposelessly sited as an ego trip for a politician or donor. (Olin, masterful as they are, have done a few of these themselves.) After all the money spent on this Lenfest Plaza, will the Academy permit its students to post notices on its surfaces, or to paint on its walls, or rally or party in it? Will outsiders – nearby office workers, those conventioneers, other tourists and city residents – feel welcome to be in it, comfortable to use it? Will it be a vital space or merely a decorated canyon? To the point: Can you impose placeness on a place merely by making it into something that is supposed to have it? Can placeness be legislated and design-built? Or is it just something that, inexplicably, just is, all of its own, with a power that it simply has and imbues, and which no one can control? Why do young children eschew certain toys and prefer to play with the boxes they came in? How do plans fire imagination, and how does imagination find the very thing it needs in order to sing, or simply to find a resonance in? Oldenburg’s brush, like the 1400 block of Cherry Street, has two ends; will it point down, attracting simpatico souls to a place they recognize as something of their own and of themselves, or will it point them away from the plaza, propelling thoughts and gazes elsewhere? We wish it luck, the Lenfest Plaza; we hope it “works.” It has big guns and good brains behind it, and the city can use it. But placeness is a funny thing – it may not be where you want it to be, but it is where you least expect it, and most need it, when you come upon it. And you know it when you feel it – the way a painter knows that that stroke of her brush is just the right one. Recently, we made a quest to find the “missing” sculpture collection of Philip and Muriel Berman, of Allentown, Pennsylvania. We did so because we had been witnesses to the growth of their assemblage of works, and despite our having no connection to the couple, we felt a kind of kinship with them and their collecting history. Collectors sometimes have a good eye and amass powerful examples of artwork from their own place in time, or a previous time period, the collections becoming representative of meaningful style or thought rendered for the ages. And when collections consist of large-scale sculpture, finding appropriate “resting places” is a difficult task. We lived in Allentown for a couple of years in the first half of the 1980s (likely an acquisition heyday for the Bermans) and there was no way to avoid their influence on the landscape of the town. For a small, formerly industrialized Pennsylvania burg, it sure had a lot of public art scattered in and around its dying, if not dead, downtown. It was, we learned, put there by the Bermans. 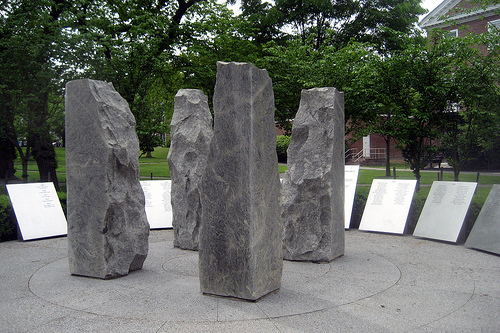 Once we even peered over the fence of their home’s backyard, a sort of suburban mini sculpture park, and recognized artworks similar to those dotting sites in the center of town. We made a connection, there and then that, based on what we were seeing, this private art was the source of all the public art. At that time, the artworks were plunked down in front of commercial structures, the works having no particular relationship to their sites, other than there being a space available. A couple of decades passed and, every now and then we would think about the Berman sculpture collection, and wonder where all those public and private pieces were now. 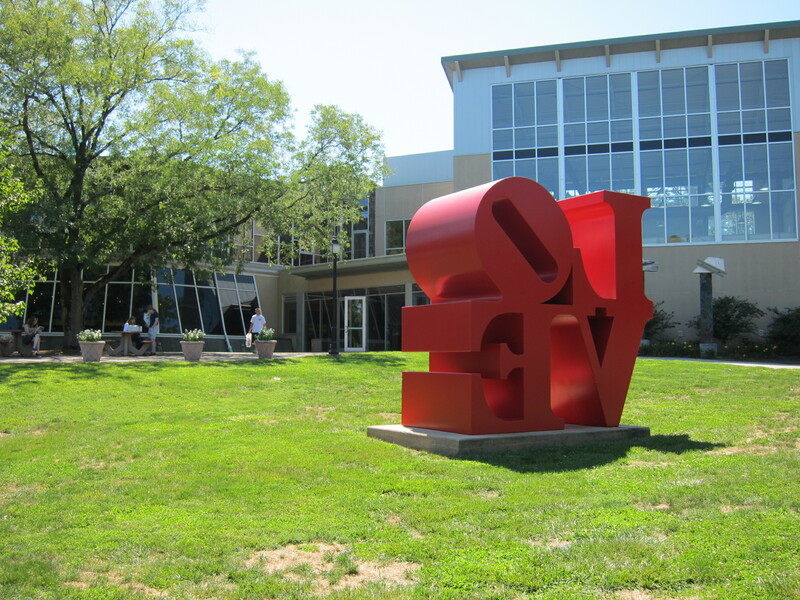 We did some research and discovered that the couple apparently had given their acquisitions to the Lehigh Valley Hospital, incorporating the works into the grounds in a kind of institutionalized sculpture park within an office-park setting. Maybe they had in mind a mini PepsiCo, since they probably had a stake in the growth of the hospital anyway. It’s funny that they didn’t try something of that nature at the family money’s headquarters, Fleetway Trucking. But, then again, maybe not. In 2009 we decided it was worth a trip back to our past to see the artworks in this strange new environment. The hospital, situated on a place-lacking lifeless tract between a six-lane highway and an interstate, had less appeal even than a commercial campus or a mall, it did not have promise and, as it turned out, it did not have sculpture either. We looked everywhere but found no sculpture. A year later, we heard that the Berman collection had found a home – for very big and heavy things, they move around a lot – at Ursinus College, a small, private, liberal-arts school in Collegeville, Pennsylvania, about 30 miles northwest of Philadelphia, and decided to have one more go. It’s a pretty campus that sits on hilly terrain, creating real possibilities for art in site. The Bermans obviously made a significant endowment, since the school’s art museum, now bearing their names, is front and center. 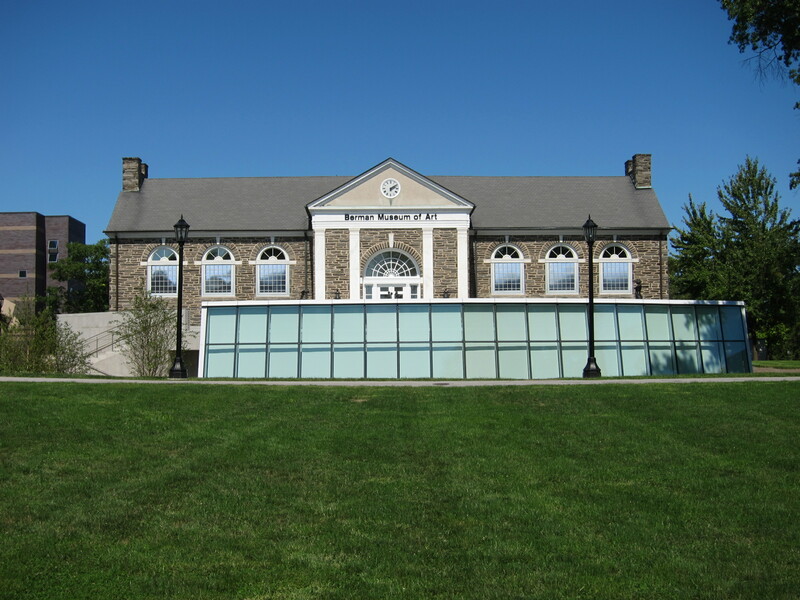 The Berman Museum of Art building is a combination of an older stone structure and modern additions; from the lawn it looks as if the original structure has been bound and gagged by the addition, and is peering out, wide-eyed, above its restraints. 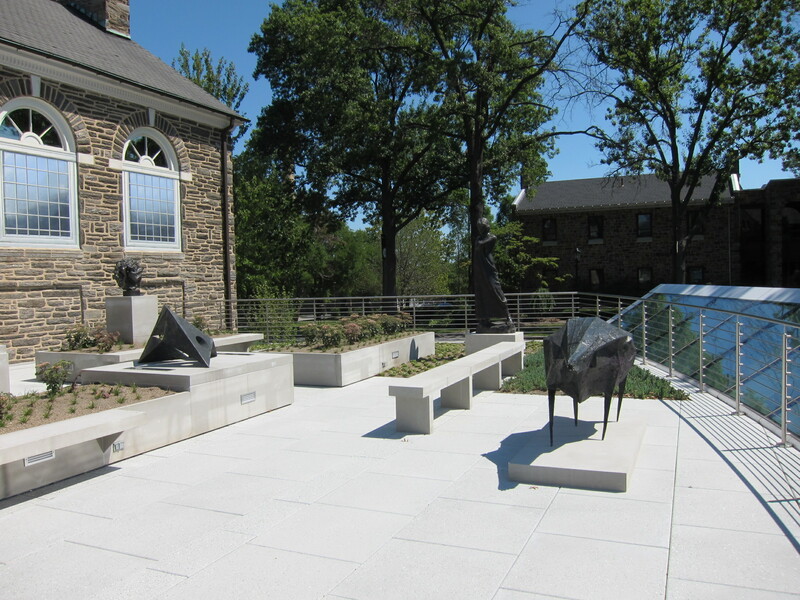 The sculptures that aren’t placed upon a raised courtyard atop the new addition are scattered about the broad lawns. And “scatter” is the word, since the works are largely plopped into empty wedges of space not useful for much else. And unless the work is actually a tribute to the British government’s Office of Low Emission Vehicles, or to a certain class of Estonian mine-laying battleships, this backwards orientation simply reads all wrong. Going inside the building for a better look, it becomes apparent, moreover, that the artwork sits in a gully and, so, even from its front side the piece is cut off at the knees. 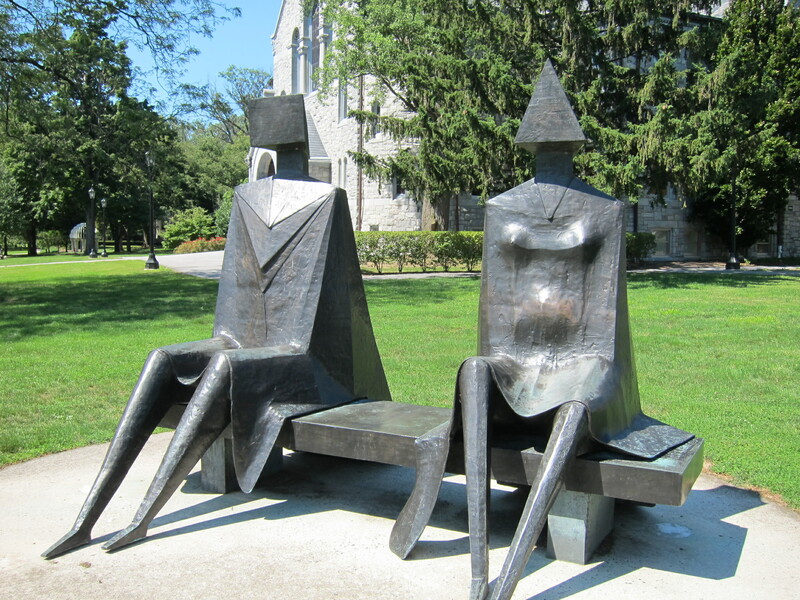 Beyond that piece, it is a revelation just how much work by Lynn Chadwick the Bermans accumulated in their lifetimes; perhaps 75 percent of the entire collection at Ursinus is by him. The works are that kind of dated-looking modern art: sort of cubist, sort of abstract, geometricized, with a surrealistic sensibility. One of his works, though, seemed particularly well-considered and well-placed. “Couple on a Seat” is two figures, one of each gender, together but apart on a bench atop a long slope, framed by some nearly ivy-league-style stone buildings. Wearing some sort of robes that resemble graduation garb, their blank geometric-solid heads stare out into the world. A perfect metaphor in bronze for college grads gazing into the void and at the future, out and away from the campus. 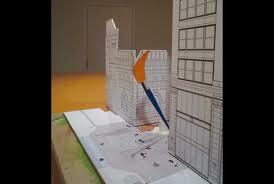 And in this one instance, there is a meaningful pairing of the art with its environment. Finally we found the Berman collection. And, happily, there is a brief encounter with arslocii.